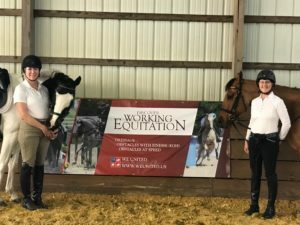 In 2018, Tri-State offered three Working Equitation (WE) lesson and hopes to be able to offer them again in 2019. Stay tuned . . .
Below is the information posted forf last year’s lessons series and a lot of information about the exciting sport of Working Equitation and even a explanatory video. 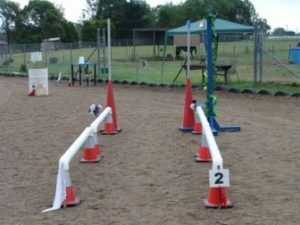 These lessons will give both our English and Western members the opportunity to ride together and use their riding skills to safely negotiate WE obstacles, in a fun and learning environment. We expect your horses will have a good time too. 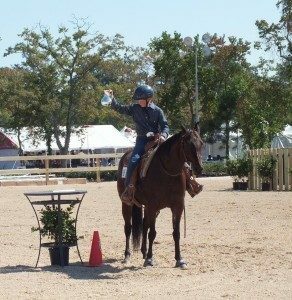 For our initial three Tri-State Working Equitation (WE) lessons, the instruction will be focused on the “Ease of Handling,” the second phase of this four-phase sport. Ease of Handling (EOH) instruction will generally be at the “Intro level” (to start). There are 10 obstacles in a course at a formal WE show. For our lessons, the WE Instructor, Kimberly da Silva, will instruct riders on the rules and how to properly negotiate five of the WE obstacles each lesson. The obstacles will be different for each of the lesson nights over the 3 months. There are three phases to a Working Equitation Show. The first phase is the dressage test in a 20 m by 40 m arena. (This is a WE dressage test, not a USDF test). The Intro test is just walk and trot. The Novice A test is walk, trot, and canter similar to a USDF Training Level Dressage test. There is a shallow trot loop and a rein back in the Novice test. The second phase is the Ease of Handling. The EOH trial is designed to represent difficulties that a horse and rider would encounter while working in the field. 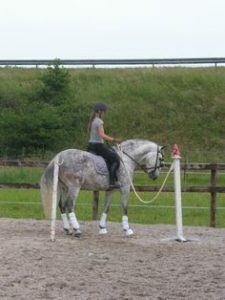 The objective is to show both the rider’s and horse’s capacity for calmness, precision, style, and regularity in performing the obstacles, providing evidence of harmony between the horse and rider. This trial is not timed. The Speed trial is judged solely on the time taken to complete the course, plus any time adjustments for bonuses or penalties. The obstacles are executed as quickly as possible, without any concern for style. This trial provides evidence of the rider’s coordination and anticipation, and the horse’s submission, speed, and attention. Pick up a Jug – halt, pick up the jug and raise it above head. Return jug to table. Horse must be immobile. Level 1: Walk in, Level 2: Walk or Trot in. Rider halts even with the bell, ring the bell, then rein back out of corridor. This could be a straight corridor or L shape corridor. Level 1: Walk in, halt, move the cup from one side to the other. Exit. Level 2: Walk or trot to halt, move the cup from one side to the other. Exit. Approach gate in a perpendicular direction to the gate. Using one hand, open the gate, pass through and replace the loop or close the gate. You may not let go of the gate or rope. For the higher levels the Gate is a solid gate. Enter the round pen at the walk (or trot, higher levels canter). Complete the circle exit, halt, turn on the haunches and complete the circle the other direction. Approach perpendicular to the pole and halt on one side. This may be a single pole, or 2 parallel poles. If you have 2 parallel poles, must change direction for second pole. If you need to ride one -handed to touch or pick up an object, always use the same hand to hold the reins and the same hand to handle the object. You can not switch hands when you need to handle the next object. In other words, if you use your right hand to pick up a cup or grab the pole, you must use your right hand every time. If you drop an object (level 2 or higher) you must dismount to retrieve it and then remount with the object. Level 1 riders will be handed the object. Obstacles requiring a full halt- rider’s body should be even with obstacle. Horses must be immobile if the obstacle requires a halt. The only obstacles that can be done at the canter for Levels 1 & 2 is the jump or a bank. You can’t cross the line of an obstacle during the trail before it has been performed. Stroking or touching the horse’s neck in front of the rein hand 3 times. Penalty each time that occurs. Failure to ride through the course entry/exit markers in the direction indicated on the course map.